Submerged floral arrangements that showcase flowers in tall containers filled with water are becoming more common, says Ginger Patterson, a designer with McAdams Floral in Victoria. The arrangement is simple yet elegant and uses fewer flowers per piece so it can even be more affordable, she said. A typical floral budget can be anywhere from $200 to $5,000, she said. Colors spring brides might consider are fuchsia, hot pink and gold. 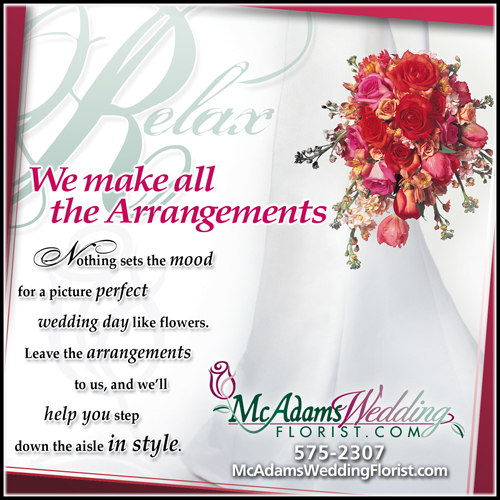 McAdams Floral is proud to participate in the new Victoria Advocate Premier Wedding Magazine, WEDDING VOW. Readers will learn about the latest and most creative trends for planning their wedding.